On Sunday for a local stroll with D and my sister, just off the plane from the UK and so walking in the daylight in an attempt to overcome jetlag. But lo, what mighty fair appears in yon fair dell or dale? It’s sponsored by Marrickville Council and has something to do with Cooks River and the environment. Note the empty row of seats on the distantly viewed stage. (You’ll probably need to click on the links to make that and any details out). By the time we descended to the ground, that row of seats was populated. The picture below doesn’t really show it, but there weren’t many more people actually watching the stage than in the first picture. Here the dignitaries are all getting ready for the official opening. Can you identify our local bigwigs? And now, proceedings underway as Aunty Fi [oral transcription], previously obscured above, gives the welcome to country. 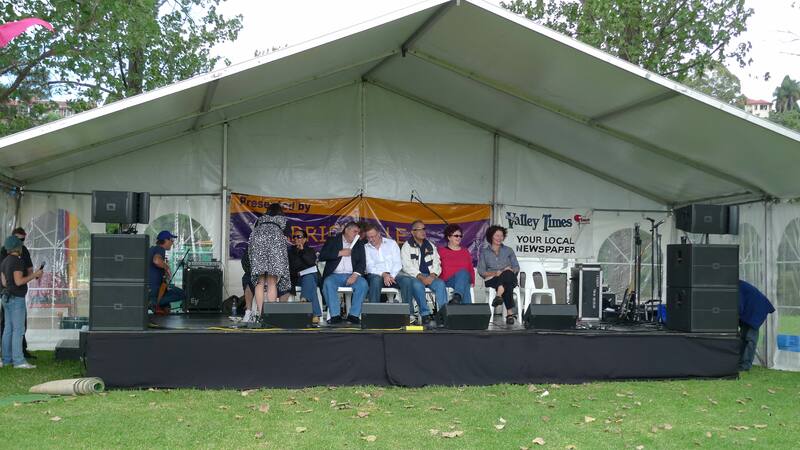 To her left (our right), Linda Burney (member for adjoining electorate and state minister), Sam Iskandar (mayor), Anthony Albanese (federal member, minister for infrstructore and govt leader in the house – his wife, local state member and minister etc sent apologies), Morris Hanna (councillor) and two other councillors. Another dignitary was offstage tending to her child (hence, I take it, the empty chair). Most of the crowd kept on with whatever they were doing. Only a few actually watched. 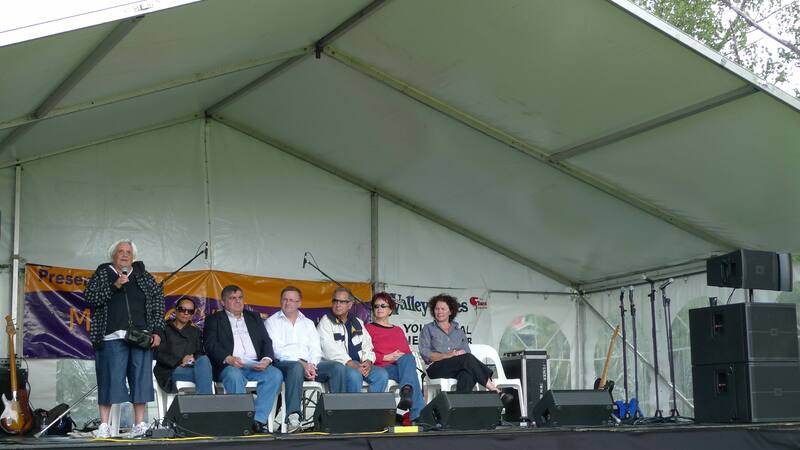 I started to with the welcome to country but the welcome from council delivered by Mr Iskandar proved too much for me. This is the grass roots stuff that is the less glamorous side of politics. The cynic in me says: these people will do anything for an audience (other than actually restore or keep-clean the litter-strewn mangrove flats, which D observed were much as ever). Less cynically, you hope that this brings politicians back to the people, but as far as I could see Iskandar and Albanese, who did their crowd meet and greet in tandem, spent nearly the whole time talking just to each other. This seems to defeat that possible purpose. “Good evening, Madam,” said the usher at door 26 to D, before apologizing. “It must be the beard,” I said, giving D’s stubble a tickle. In fact it was probably D’s very brightly-coloured shirt, as well as the vast preponderance of women and girls in the audience. You could sense that in the pitch of the conversational hum as you walked in. In our row (F of the stalls) there were, including us, only 6 males out of 30 all up, and I’d say that was about the ratio generally. It was D’s birthday, and we had gone to see the Australian Ballet’s Firebird and other Legends. It is an odd little twist of history that an art form that originally had more than a bit to do with providing an opportunity to men to ogle the female form (cue: Degas’s ballerinas) the audience is now overwhelmingly made up of women who must surely identify with or aspire with the ballerina myth. I guess it’s not so different from the reason lots of men go to sport. Of course, I’m making a big assumption here about my fellow audience members, but it doesn’t seem such a very wild hunch. Naomi Wolf, where are you? It’s also a generalisation, and I don’t for a moment mean to suggest that such aspirations or childhood dreams mean that the audience doesn’t have a more specific appreciation of the relevant forms. Thomasina gives a much more detailed and also well informed account of the occasion than I ever could. For what it’s worth, though, it took me a while to even begin to relax into what Les Sylphides was about. About the time it really was beginning to mean anything to me, it was finishing. I certainly agree with Thomasina about some of the tempi adopted. In particular, as there was no dancing at all at the beginning, why did it have to be sooooooo slow? I enjoyed Petrushka, partly because of having seen a filmed version on Youtube last year at Thomasina’s prompting. I was surprised to read on the AB brochure that they haven’t done it for forty years. And the music was certainly a step up from Chopin arrangements. Lacking Thomasina’s allegiance to the original Firebird, I could warm to Graeme Murphy’s version without her reservations. D, who dreamt in his youth in Shanghai of becoming a dancer, was more in Thomasina’s camp in relation to the missing details of the story. In the second last tableau, when things began to go on a bit, I do wonder if it was those missing details which were the problem (though the opera theatre pit and the malnourished violin sound also took a musical toll). It probably didn’t help our appreciation of that scene that we used to have a beach towel very similar to the slightly Hawaian-looking outfits worn by the men of the corps-de-ballet. We liked Chengwu Guo‘s slinky outfit as the baddy Kotschei much more. It definitely allowed for a specific appreciation of the relevant forms. Last October, the Full Court of the Fiji High Court held that the removal of Mr Qarase and the assumption of power by Mr Bainimarama in December 2006 and January 2007 was lawful. The president has gone along with Bainimarama since January 2007 (when he ratified Bainimarama’s coup – including Bainimarama’s usurpation for a while of his own office) promptly dismissed the judiciary, abrogated the constitution, and assumed power himself. Bainimarama says he didn’t put the president up to it, but it seems Bainimarama has now been reappointed as “caretaker” prime minister. That must involve quite a lot of caring, because any elections may not be held until 2014. The Fijian constitution laid out a code for the circumstances where a prime minister could be dismissed (so that there was very little scope for any use of prerogative powers). The dismissal of Qarase had occurred and couldn’t be ignored (and it wasn’t practical to order his reinstatement subject to undertakings by him to call elections and then basically resign). They were spectacularly unimpressed by the refusal of Bainimarama and the regime to give any undertakings as to when he or they might cause elections to be held. Elections need to be held to produce a prime minister enjoying the confidence of the house of representatives, who then could advise the president in the normal course as envisaged by the constitution. Necessity was a valid basis for the president to appoint a prime minister who could then advise the president to call an election so that, eventually, a normal prime minister could be appointed. They also offered a spirited defence of their own and others’ acceptance of appointments to the Fijian judiciary at a time when the legality of the regime itself was questionable – namely that the Fijian people should not for that reason be deprived of the rule of law. That’s partly a nod to the rather savage treatment Jocelyn Scutt received at the hands of The Australian. Having ruled as they did, I suppose they are entitled to make that argument, even if the consequences go to show (as if there were any doubt) that lawyers can’t play rule of law on their own. I didn’t go down to Melbourne for the Opera Australia Annual General Meeting on Thursday (short report here). Instead, I found myself at an afternoon callover in the District Court before the Judicial Registrar – the sort of job you find yourself doing when others have gone away for Easter. After, on the way home, I dropped into the Fish Markets, by then practically closed, and picked up a dozen scallops on the shell and a nice looking “Sashimi Snapper,” whatever that exactly is. Being involved in religious ceremony as a chorister rather destroys your sense of mystery: you see too much of the stage machinery, and become impatient as a mere member of the congregation. The last time I went to church other than for a funeral was to Saint James King Street on Good Friday three years ago. I found I could hardly bear it. That was when I definitively realised that I had become post-religious. Despite that, Good Friday is one of my favourite days. I like its quietness and its sombreness – a bit of a piece with my preference for slow movements, I suppose. And of course, it is a big day for religious art, especially choral music. For some years in the later 80s and early 90s, I liked to have a fishy feast followed by evening attendance at the Sydney [then, Sydney University] Chamber Choir’s Good Friday concerts at the Great Hall at the University of Sydney. In those days this was almost literally the only show in town, and there was even something rather austere about queueing up out the front of the hall beforehand on the darkened campus. Even then, my motives were primarily aesthetic: I deeply disapproved when Etienne Chin, a Sydney music student who had got religion, yelled out “Alleluia!” in the pause before the applause after the last chorale of Bach’s St John Passion. At some point, the Chamber Choir discontinued its Great Hall concerts – possibly because of fire regulations, which were always an encumbrance. If so, that is pretty ridiculous since graduation ceremonies and other non public entertainments continue unabated. They also stopped performing on Good Friday (maybe because of overtime issues at other venues) and, for that matter, my own allegiance faded. So, this Good Friday, after a pre-concert penitential repast of half a dozen scallops each (cooked in a manner faintly resembling Coquilles Saint Jaques), D and I set off for Carriageworks in Wilson Street, Darlington, for the Song Company’s Tenebrae III. I missed the first two installments of this project at the Sydney Town Hall in 2005 and 2006 (some clips of that here and here), and the projected completion and performance of all three parts in 2007 never occurred. I’m not sure why that is but there are muted allusions to disruptions at the Song Company itself and in the meantime the collaboration with Force Majeure (the original dance contributors) seems to have dissolved. The concept of the Tenebrae series, loosely stated, is a performance of the Gesualdo settings of the responsories for the Tenebrae services (offices in Holy Week where the lights are, traditionally, extinguished) as well as the associated plainchant settings of the lamentations of Jeremiah by singers, moving (in singer-friendly ways) together with three dancers, who obviously are allowed rather more extremity of movement, as well as a discreet amount of soundscape and some lighting effects. There are three Tenebrae services: Tenebrae III used the responsories for the final, Holy Saturday, service. 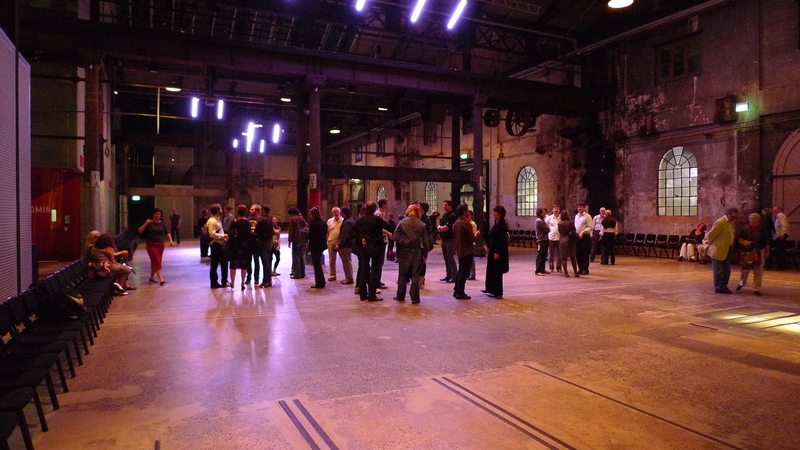 The space used was the quite vast foyerish area of Carriageworks. A single row of chairs was set up round the perimeter (there were two rows at one end). There was some delay before we were allowed in as the concrete floor apparently needed conditioning in some way. As we entered, the singers were already leaning against various industrial pillars, and shortly after that the three dancers (two men and a woman) started a kind of running bungee jump – the woman running between the two men and swinging around them and returning, running faster and faster between them as they moved further apart along the long axis of the space, finally collapsing on an spot at one end which was lit from beneath the floor. There was a roar of soundscape. Then, entering from from “offstage” one of the singers (call him the lector) started singing the plainchant. The acoustic was luxuriously bathroomish. The lector was finally joined by the other three men. Then, (beginning with the lector, who sang the opening line) the responsory, now polyphonic with the women also singing, started. The dancers started moving. We were off. At this point, my patience to give a detailed account is exhausted, and even then has probably outlasted my skill. The singers moved around the space (important in order to fill it and to reach all the audience) and certain key gestures (such as the rushing one-by-one of the dancers to the under-floor-lit spot) were repeated. I’m not sure what, if anything, many of the dance movements were supposed to mean, other than vaguely stylised grief. That is my only grudge with the presentation: the program notes referred rather learnedly to the various responsories, but nowhere was there a list of them, let alone a text. Some of them were familiar to me through the Latin, but not all of them. I understand why they didn’t want an audience peering into their program notes, but perhaps some information could have been provided outside beforehand as more of a guide. As it was, I was reminded a little of the furniture and other objects at the end of the film Summer Hours – stuck in a museum and passed only half-comprehendingly by the multitudes. Ironically, as I’ve already suggested, the museum is probably where I am happiest to meet religion – and I expect in the audience present I was far from alone in this. So you can see I am having it both ways: the abstraction may have meant that I was less moved than I otherwise would have been, but it is also possible that it spared me embarrassment, a bit like the way some (not all) opera in a foreign language frees you from the silliness the words if sung in English. That last paragraph has come out sounding like a complaint, which it isn’t really, because I found the experience absolutely compelling. Part of it was the shared concentration of the (my guess) 250 people seated round the perimeter of the space in shared engrossment (not a cough or snuffle), and also the effect of the singers moving together and liberated from behind their music. It is a while since I have heard the Song Company in the flesh, and I have forgotten how good they can be. In fact, I think they have got better. And the Gesualdo is musically very striking. We sat near a door, which though closed, let in through the cracks the occasional waft of woodfire smoked air. Unfortunately, it also let in the intermittent chugging of a refrigerator van tethered to a power pole in anticipation of the next day’s Eveleigh produce markets, but I overcame this. Our neighbours were traditionalists. They thought the choreography boringly repetitive and much preferred the Tenebrae when the Song Company had sung them in the Rose Bay chapel, extinguishing the candles one by one. They said that was more moving. 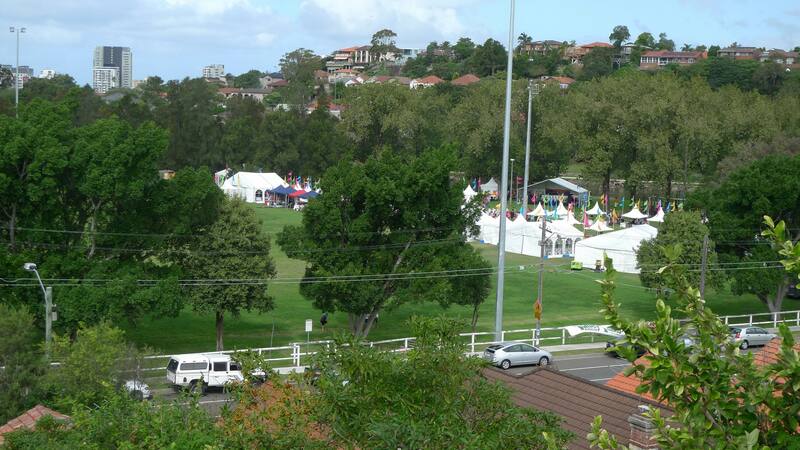 I am sure I would also have liked this, but I’m not sure I would have gone all the way to Rose Bay to see it. I’m relatively indifferent to dance, but I thought the repetition served some function, as did the dance itself. The whole piece is unlikely to have been nearly as effective if we simply had singers walking and moving around that vast space. The dancers certainly helped D, who is not so keen on Renaissance polyphony, and likes to tell the tale of the two elderly ladies he sat next to at a Tallis Consort concert, who told him “We love this music” only to promptly fall asleep. The Tenebrae program and publicity featured a rather eroticised naked upper torso shot of one of the male dancers. D gave me an appreciative nudge when the men (rather belatedly, in his view, I think) finally got round to taking their shirts off. The whole thing was over in about 50 minutes. I wished it could have gone on longer. I was moved – not so much by any particular moment, but by the whole as a kind of meditative experience. The after-effects of this persisted as we went out (past the annoyingly chugging van) into the dark and wood-smoke scented Wilson Street. Back home, we continued our seasonal observance by having the fish for dinner. I returned on Saturday night for the final performance. As can happen when you do this, I didn’t quite manage to recapture that first fine careless etc. The audience was much smaller (I was told it was an additional performance) which inevitably diminished the sense of occasion. Thankfully, the refrigeration van was gone, though there were a couple of coughers. I’m not sure if the singing was quite as good as on Friday. More likely, knowing what was coming, I was more calculating in my own response – more able to see through the striking first impressions to how they were actually achieved: instead of the singers bursting spontaneously and at moments seemingly miraculously into song, I heard the quietly hummed note given in preparation. Perhaps I’m just too resistant to mysteries. The night after going to hear Lady M of Mtsensk, I backed up to the opera theatre with D for Massenet’s Werther. That, as the poem previously relates, being how Werther had first encountered her. The opera beefs up Charlotte’s part and provides the obligatory death scene and parting. I prefer the earlier acts, and particularly the moment (at the end of Act III) where Albert twigs to what’s going on. I’ve seen this production before and I like it. Murray Black in the Australian complained that the updating robbed Charolotte’s adherence to respectability of much of its force, but as Thackeray’s poem suggests, that aspect of the story was always a bit laughable and I’m not convinced that it was a very serious aspect even of the opera as originally produced about a century later. The focus always seemed to me to be on that moody barely post-adolescent “Young Werther” with some necessary operatic shifting of the balance towards Charlotte. It was a salutary experience to come to Massenet fresh from Shostakovich and to experience the orchestra’s change of style and personality overnight (though obviously not all the players were the same). The music is unutterably sweet, though it doesn’t remain as sweet as it starts (that’s part of the summer-to-winter plot). It’s French chocolate-box stuff: there is a saxophone as well as two cornets-a-piston. I’ll have to leave the question of why the saxophone never finally caught on in the orchestra for another day. For the second time this year I noticed the Australia Ensemble’s clarinettist, Catherine McCorkill, playing principal. I don’t know if she was just filling in for the individual night or for the whole run – she received special acknowledgement from the conductor at the end and deservedly so. I tried to find one particular excellent moment in the score by way of illustration, but I left it too late to find it. All it reminded me of was the variety and range and sheer energy of the orchestration. There was also a children’s chorus (one of Charlotte’s younger brothers was rather heartlessly sent out to work as a paper boy in Act III) and a number of non-singing extras (no adult singing chorus), including a “model” with extraordinarily long legs. The conductor was Emmanuel Plasson. He of course replaced Richard Hickox. That means that, had he still been with us, Hickox would have been conducting the seasons of Lady Macbeth of Mtsensk and Werther at the same time. I know he loved what he did, but with the benefit of hindsight everyone must be asking if he took on too much. Michele Losier, who replaced Pamela Helen Stephen, started off rather unprepossessingly (D even thought she might just be an acting supernumerary on her first stage appearance) but in fact that’s just part of the concept of the role. She had plenty in store for the big moments when they came. Aldo Di Toro was fine: I’ll be more than happy to hear him again. I particularly liked Andrew Schroeder, whom I think I last saw as the Count in Perth. It’s also good to see Stephen Bennett on stage. I have heard that he was de-rostered by Simone Young – which if true goes to show that Hickox was not the only MD to have preferences and non-preferences. As a result (he took a day job in Canberra at the School of Music there) he seems to have made a leap straight to senior (or (yuk!) “elder”) parts, which seems a bit of a waste of his prime. Sarah Crane as Sophie was a bit of a caricature, but I don’t think that is really her fault. There were a lot of bicycles – all of them, for some strange reason, “Apollo”s. This was the last night of Opera Australia’s 2009 Sydney summer season. Three recent concerts to note. I hope to write about Werther separately. The Saturday before last, to hear the SSO and Paul Lewis conducted by Douglas Boyd. I’d heard the slow movement of the Beethoven 1st concerto (actually his second) before at the Utzon memorial. It was better in my normal seat and with the organ turned off. The second half of the program was Bartók’s Music for Strings, Percussion and Celeste. That’s a rather cunning title because the he slips in a piano (could be either percussion or strings, though properly probably the former) and a harp. Maybe I have a bit of a problem with Bartók because I can’t say I really warmed to it. He so often seems a bit of a cold fish. I have never been keen on Mikrokosmos – it just seems interminable – so many books! Paul Lewis has lovely eyelashes but his beautiful curly hair seems to be taking a tinge of salt-and-pepper. Oh well, youth cannot last forever. Oddly, Douglas Boyd is a rare creature amongst conductors: one who actually looks younger on the podium than his program portrait suggests. At the end my neighbour asked me why the orchestra (an enormous double string orchestra with the piano celeste harp and percussion) didn’t look happier. I wasn’t really sure why. Sometimes that means they didn’t like the conductor or found him hard to follow, but it might in this case just have meant they were exhausted, as it was quite challenging for them. The next Friday I returned for an all-Beethoven program. I’m not so sure this isn’t too much of a good thing. We had the Fidelio overture (all those different overtures are a constant source of confusion to me) and then Beethoven 2 (really 1) and, after interval the second symphony. It wasn’t until about a third of the way into the first movement of the concerto (when there is a descending leaping figure under a kind of hanging inverted pedal point) that I really felt and recognized I was in Beethoven land. The second movement satisfied my established enthusiasm for slow movements – I particularly liked the open pedal conclusion – only possible on a nicely in tune grand in a big space – don’t try it at home on the upright! The last movement is the most well known. The symphony was also enthusiastically received but at this distance of time I will have to retreat into not being a critic. A smaller orchestra was deployed. This gave a better opportunity to hear the new Steinway than the last concert. Before that, the D’Indy only really gelled in the slow movement. The harp, which in principle I love, was more dominant than I expected and those sudden movements to damp vibrating strings, lost in the mass of the orchestra, were strangely distracting. Before the Copland, it was beginning to feel a bit like a school concert, with so many short pieces. The Copland was billed as an eleven-tone-row twelve-tone composition where Copland gradually composed himself out of the method, but even at the start you would hardly have guessed it, though it wasn’t to T’s taste. It seemed fiendishly difficult and received a bravura performance. P and I reached the same conclusion as last time – that the piano was “very smooth” – but this time with a much heightened appreciation of its positive qualities. In his program notes, Professor Covell rambled around the question: why did so many American composers go to Paris? Apart from the obvious matter of going to Europe, and not wanting just to go to the land of George III, I wondered if it might in many cases have had something to do with their sexuality – surely a factor for at least Bernstein, Paul Goodman, Cole Porter, Aaron Copland – just to take some of the examples Covell touched on. Oh, I am a monomaniac! The other day a colleague suggested that Nathan Rees batted for the other team (meaning the Liberal Party) because of his government’s meanness about public holidays, and I was thinking of something different altogether. She told me to get a grip. P commented, and after the Dvořák, I was inclined to agree, that the string quintet is her favourite combination: the fifth instrument (here and I think best, a viola) gives greater compositional freedom than in the customary quartet, allowing more figuration, or, quite often, octave doubling by two players (mostly the violins) whilst the other three can still provide a full accompaniment. Predictably, my favourite movement was the slow one, even if it was variations. There were a few more empty seats near us than usual, and I wonder if those who have to be seen were taking a stand at the State Theatre where, on Friday and Saturday night, the ACO was playing a program with Katie Noonan accompanied by Bill Henson images. Life is hard and vodka’s cheap. Why not drink yourself to sleep? Last Wednesday, twice to the Opera House. In the morning to the State Memorial Service for Jørn Utzon. I don’t usually do this kind of thing, but I was spurred to go by Wanderer and, I confess, I was curious to see a little bit of history. Before I left home I had to hang out the washing, and there were other things to be attended to before I was free to leave my workplace. These are practicalities, or my excuses. David McAllister, artistic director of the Australian Ballet, gave a relatively short speech, mostly about the magic of the opera house as an aspiration-inspiring icon. He was tactful about the need for “catchers” in the wings. Then Neil Finn sang “Don’t Dream It’s Over.” I guess that would have meant more to you than me if you were already familiar with the song. John Bell read David Malouf’s piece, published that day in the SMH. This was followed by a speech by Peter Garrett. From the moment he launched into the ritual incantations (Your Excellency, the Administrator, Marie Bashir, Premier, Chairman, Executive Director, distinguished guests…blah blah blah) Garrett must have known he was going to fall flat. No-one else I heard did that, and in any event, representing the PM (absent on his G20 jaunt but also recently having let it be known that the Commonwealth wasn’t interested in fulfilling the Utzon dream and renovation/reconstruction of the SOH interiors) Garrett was, as ever, a bit of a lame duck. Cate Blanchett read a bit of Shakespeare (why not by heart?). Nathan Rees, who spoke next, did much better than Garrett. Sure, his delivery lacks the Bob-Carr broadcast voice and manner, but the material was well-turned. The basic thesis was that, if the Opera House is “the people’s house” (actually a questionable premiss) it can’t be because lots of them go there, because they don’t. It must be because of the love it inspires and its symbolic (he probably trotted out “iconic” again) importance, although he was keen to emphasise the many opportunities people have to not just walk around but come inside. All of this was consonant with the State government’s recent announcement that it was prepared to back the Utzon dream (as defined above) to the tune of about $450 mill, provided someone else (ie, the Cwth) came up with the balance of $550M (estimate). Of course, given the NSW Govt’s propensity to unannounce and then unannounce large projects, all of that must be taken with a grain of salt, but at least it put Rees in good odour with the audience. In fact, I suspect that it was less than a coincidence that the NSW Govt made this announcement shortly before the service [? service? I’m struggling to find the right word: memorial alone doesn’t ring true], and of course the occasion itself, whatever personal respect the opera house management might have for Utzon, was clearly directed towards the SOH’s promotion of its own mythos and canvassing of support for the Utzon dream. Rees was followed by a woman whose mother had worked for Ove Arup in London before later emigrating to Australia. I found that a bit corny, but others seemed to think it was a good touch. It did mean that we heard indirectly from “the workers” – the propaganda advantages of that, in the circumstances, are obvious. The SSO and Paul Lewis played the Largo from Beethoven’s piano concerto No 1 (the background wheezing of the organ windbox which remained on after the processional in anticipation of the recessional) didn’t help here. 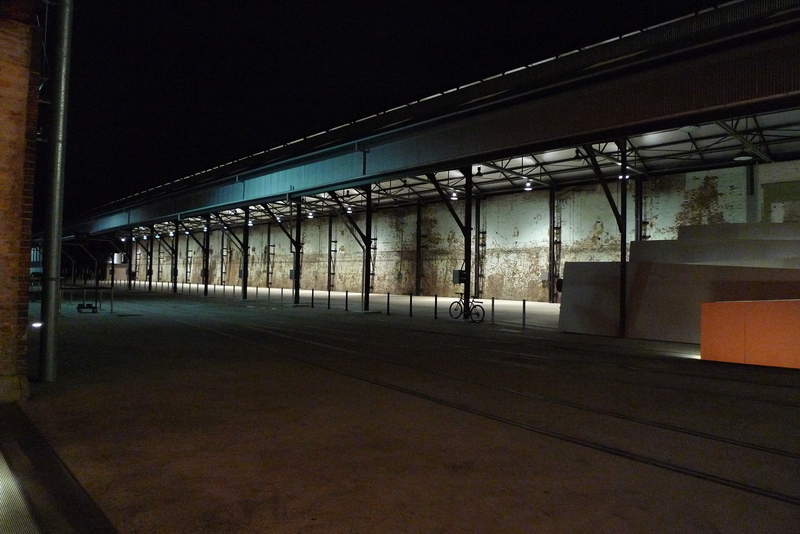 Richard Johnson, the architect who liaised with Utzon on the recent project, then spoke. (Worryingly, I think he also designed the now-abandoned Sydney Law School, though not all of the defects of that building are necessarily his fault.) Things were getting more personal. Then two of Utzon’s children, Jan and Lin, responded. To me there is something oddly courtly about Scandinavian accents. There was a kind of gender division in their speeches. Jan, one of the sons, told a few anecdotes, mostly amusing. Lin started with a daily prayer her parents said to each other (in Danish) and finished with a poem (in English). It was true that, as the SMH later reported, there was “not a dry eye in the house.” On the big screen above the stage, Richard Evans, the SOH CEO, who said he was “moved,” could be seen blinking away tears. We wound up with the “Easter Hymn” from Cavalleria Rusticana sung by the AO chorus and Nicole Youll with a bit (and at the end a lot) too much amplification . Pity about that. On the way out I was interested to see that the video footage of the opera house sails which we were treated to from time to time on the big screen seems to have been live footage from one of those cameras on a big cantilever, just to the east of the Opera Theatre shell. In the evening I returned to see, for the last (for any foreseeable time) performance of Lady Macbeth of Mstensk. I took T, son of my old friend P. He is in year 8 now and taller than I am. It is hard to believe that only about 2 years ago (well maybe it is coming up to 3 by now), when I took him to see Hansel and Gretel he still had to have his hand held when we crossed the road. His mother provided the funds for a student rush ticket, and I was shocked to discover that this is now $55, plus a $5 “transaction fee” imposed by the Opera House on each box office transaction. That is too much, and with a (my guess) 75% house at best, criminal. I also took my friend Mq for her 60th birthday. (That was my treat.) She is keener on theatre than opera, and so I thought this would be just the ticket. As I did on the last occasion, she missed the exact moment when Katerina pushes the other woman into the water and follows her in to their death. I think that means there is something a bit wrong with the direction at that point, though this may partly have been because we were in row C. I remain unconvinced by the mournful babushkas, though I now see (prompted by Mq) that they were meant to be professional mourners. They were still unnecessarily distracting from John Wegner’s deathbed scene. Kanen Breen got a round of applause for his drunken discovery of the corpse in Act III, from which the title of this post comes. As chance would have it, we were sitting next to two other old friends, E and Sz, so it was really quite a cosy night. To my left, though, was a man with a shocking cold. It was awful! There were coughs and splutters and a much reused handkerchief. He was really too sick to be there. I know this is a difficult situation for an opera lover, but I refuse to believe that the symptoms and the infectious risk could not at least have been held in temporary check with the right symptomatic treatment. Fortunately, Sz’s legs are so long that he moved to the end of the row for the second half and I was able to move away (pretty pointedly, I know, but c’est la vie) to relative safety. Mq had driven in to the SOH carpark. As it was raining, T and I took a short lift with her to where I had parked the car. One of the three exits from the carpark is now reserved for “platinum parkers and subscribers.” It’s not much help to them until the last minute, because the queue of cars blocks access to it. All it means is that everyone ends up waiting about one-and-a-half times longer to get out than they otherwise would have. By the time we got out, the rain had passed (don’t worry: I had brought the washing in when I went home for my nap), and it would definitely have been quicker for us to walk. Still, it gave us the chance for a post-opera post-mortem. You are currently browsing the Stumbling on melons blog archives for April, 2009.